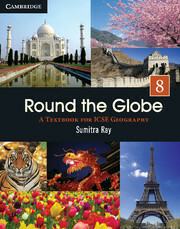 Round the Globe incorporates the syllabus guidelines of the Inter-State Board for Anglo-Indian Education. 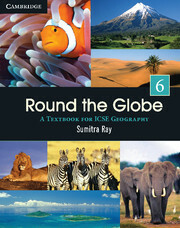 Round the Globe: A Textbook for ICSE Geography incorporates the syllabus guidelines of the Inter-State Board for Anglo-Indian Education. This three-level series for classes 6 to 8 not only prepares children for the more detailed study of Geography in high school but also motivates them to do so with enjoyment, interest and curiosity. 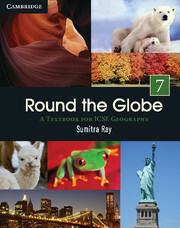 The series uses a friendly and interactive language which urges students to think, reflect, reason and in the process develop their own understanding and awareness of the various geographical facts and occurrences presented in the books. Learning Objectives give a quick overview of the chapter-content. By the Way! are additional information and trivia relevant to a topic. Find Out! are questions and research ideas to encourage independent research. Try This! are experiments and project ideas to encourage learning-by-doing. New terminologies glossed as footnotes. Fact boxes to explain a concept in detail or to list statistics relevant to a topic. Let’s Wind Up summarises key ideas and points at the end of every chapter. Think and Answer covers a range of objective and subjective exercises which adhere to the examination specifications. Mixed Bag covers an array of application-based tasks and creative games related to the topics to hone reasoning and observation skills. Geo Quiz are MCQs for revision and to further the interest of the learner.